Growing up I had oftentimes heard stories of friends and family having incredible adventures at Isle Royale National Park. I have always desired to experience the island for myself and return with my own stories to share, and working at Bearskin this summer has allowed me to do so. My aunt, a Grand Marais local and wonderful backpacking companion, agreed to join me on my Isle Royale adventure. On one of my days off, she and I packed our bags and headed to Grand Portage early in the morning to catch the ferry to Isle Royale. The weather for the ride was perfect; the water was like glass and the rising sun quickly warmed up the cold Superior air. The calm condition of the water allowed us to see the famous sunken steam ship “America” very clearly as we pulled into the Windigo port. My aunt and I quickly got our park permits and settled into a campsite, eager to hit the hiking trails. We decided on hiking part of the Huginnin Cove Loop, a nice wooded trail where we were hoping to see some beautiful sights and maybe even a moose. The views on the hike were lovely and though we didn’t see a moose, it was very enjoyable to find hundreds of their tracks along the trail. By the time we got back to our campsite we were looking forward to a big meal, and we soon found out that we weren’t the only ones. As I was cooking over the camp-stove, I heard some splashing coming from the little stream behind me. To my surprise, there was a moose coming down to the water right across from our site to join us for dinner. We watched her munch on plants along the shoreline for a good 15 minutes before she swam right over to our campsite and trotted off into the woods just a few yards away from us! It was the most amazing moose experience either of us had ever had. The next morning we were ready to take on more hiking adventures. We chose to do the Grace Creek Overlook trail along the lake because it got hotter and buggier the further inland we went. Walking along the water allowed us to watch boats and sea planes come into and out of the Windigo harbor and it also provided the perfect habitat for Lady Slippers–we must have counted over 50 of them along the trail! After we finished our hike, we packed up our bags and headed to the boat for our journey back. 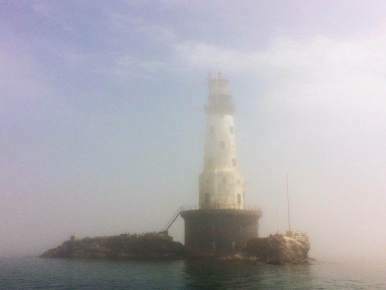 The weather was very overcast, creating an eerie sight as we passed by the Rock of Ages Lighthouse which was barely visible through the fog. Before we knew it, we were back at Grand Portage and on our way home, excited to share our own new stories about Isle Royale. It was an amazing experience and I would definitely recommend the trip to anyone looking for a unique adventure.